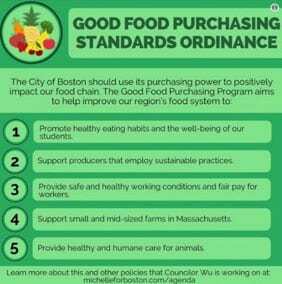 Earlier this week, Boston’s City Council passed the Ordinance Regarding Good Food Purchasing Standards, adding their city to a growing list of municipalities that have acted to use the purchasing power to build a healthier urban environment. This positive step is the outcome of nonprofits banding together in common purpose for a significant policy change. The ordinance builds upon a holistic vision of a healthy and sustainable food system. In awarding contracts, Boston will use a number of interlocking criteria. The plan is to purchase food from small and mid-sized agricultural and food processing operations within the local area that utilize sustainable and healthy practices. From farm to delivery, businesses contracting with the city should respect workers’ rights and pay living wages. Farmers should be paid fair prices for their produce. Food service programs will promote health and well-being by having balanced menus with foods low in salt, sugar, and food additives. Maybe the Boston City Council means well, but there’s the appearance that they are leveraging the lucrative purchasing power around feeding school kids to effect large-scale political and social change in the region, extending far beyond Boston. Last month, it was the “fair workweek” bill that sounded good in name but was odious in reality. Now we are presented with the Good Food Purchasing Program. The Boston Public Schools have plenty of problems to tackle that more directly impact their students’ learning environment. We’d like to see a price tag on this initiative and an explanation as to why the goal of feeding Boston’s school children is tethered to effecting larger social change. 412 Food Rescue recovers food about to be thrown away and delivers it directly to people experiencing food insecurity. With a goal to have chapters in 20 cities by the year 2020, this is not an organization that thinks small.